The Mobility Roadshow: the UK's biggest event covering every type of disability aid and incorporating Get Going Live takes place at Donington Park Circuit, Derbyshire on 25th-27th June. Get Going Live is a free-of charge test-driving event for young and novice drivers aged 15 and over with disabilities who are keen to discover how to get behind the wheel of an accessible or adapted car. All young visitors are welcome to attend the show with their families to discover the latest advice, specialist driving tuition and vehicles available for individuals with a variety of conditions. Whether drivers use wheelchairs or not, attending Get Going Live! offers the unique opportunity to test drive vehicles around the historic and exciting Donington Park Motorsport circuit for free. This track is the location for the British Motorcycle Grand Prix and British Touring Car Championship so promises an amazing experience for all young attendees. Specialist professionals in dual-control vehicles will accompany every young driver, so they remain safe during every test drive. Leading motor manufacturers such as Ford, Vauxhall and Hyundai will have a range of specialist vehicles on display, both in the exhibition hall and on the test track. Did you know if you have a disability, you can gain a driving license a year earlier at the age of 16? Visiting Get Going Live! will provide all the information required to achieve driving independence and visitors will even be able to try out the theory test. This year Aaron Morgan, the only disabled racing driver to compete in the Production BMW Championships, will be at Get Going Live! as a show Ambassador. Aaron said: “Get Going Live! promises to deliver an amazing and unique day out for all young visitors and their families. As I race at Donington Park, being able to test drive accessible cars around the motorsport circuit for free is an amazing experience not to be missed! Get Going Live! 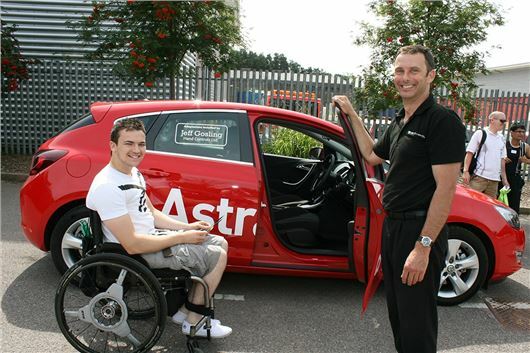 is a ‘must attend’ opportunity for young people who are looking for their first adapted car. I can highly recommend it as you can talk to experts and find out from other people about how they learnt to drive. I will be at the show and really look forward to helping other young people with disabilities get in the driving seat.” Show Ambassador Callum Hodgson will also be available to answer questions about driving with a disability as he first discovered adapted hand controls at a previous show. Also, as Get Going Live! is part of this year’s Mobility Roadshow, visitors will be able to see the many independent living products and services from other exhibitors in the Donington Exhibition Hall. There will be a vast range of products on display including wheelchairs, car boot hoists, ramps and in-vehicle safety systems.